If oatmeal isn't one of your favorite breakfast foods, the rich, nutty flavor of steel-cut oats may change your mind. As an added benefit, steel-cut oats add a healthy element to your breakfast, because steel-cut oats are a whole grain rich in vitamins, minerals, protein, antioxidants and fiber. Steel cut oats require a longer cooking time of about 30 minutes, but a bowl of steaming-hot steel-cut oats takes less than 10 minutes in your microwave oven. 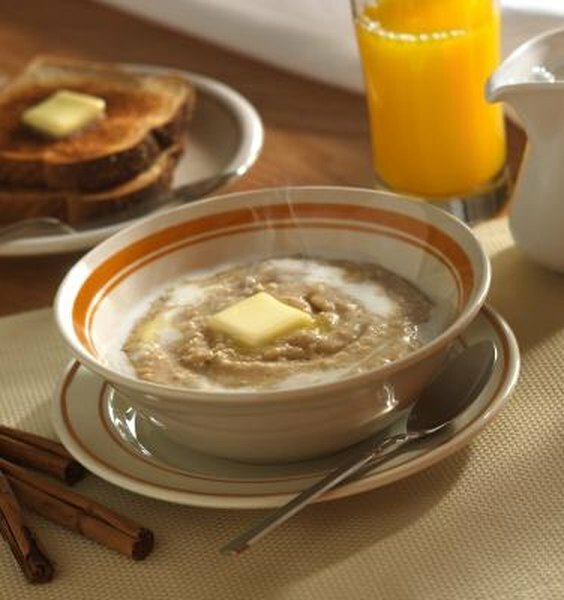 Steel-cut oats are also known as Irish oats or Scotch oats. Pour a 3 to 1 ratio of water and steel cut oats into a large microwave-safe bowl. Use a bowl that is only half full at this point, otherwise the oatmeal may boil over. Stir in a dash of salt. Prepare only one serving at a time. Cover the bowl securely with a piece of microwave-safe plastic wrap. Cook the oats at high power for five minutes. Remove the plastic wrap and check the oatmeal. Cooking times vary depending on the type and size of your microwave. The cooking time also depends on your personal preference, as some people like chewier oatmeal requiring less cooking time. Longer cooking time produces softer oats. Recover the bowl and cook the oatmeal until it is done, stirring after every minute. Stir in your choice of sweetener, such as brown sugar, white sugar or honey. Eat the oatmeal as is or stir in your choice of additives, such as walnuts, cinnamon, raisins, dried cranberries, dried fruit, berries, chopped apples, sliced bananas, or a small amount of butter.